The first investment piece we think of for fall is a fabulous jacket, and tailoring is the hot trend for the Autumn/Winter 2014 season. Close cut pieces, like those from the collections of Hermes, Akris, joseph, Jil Sander and Maison Martin Margiela all featuring charcoal grey fabrics in different textures, and are all equally classic investment pieces to keep in mind. Hermes also showed a few oversized topcoats that feel a bit more modern in the grey family. Even as oversized pieces, they still keep their perfectly tailored essence. Giorgio Armani, Givenchy, Paul Smith and Richard Nicoll all showed off boxier silhouettes with their tailored jackets for the season, giving them a slightly more menswear feel. And from Stella McCartney, Ports and Roland Mouret, we are seeing navy take off, giving the tailored look a bit of a military edge. 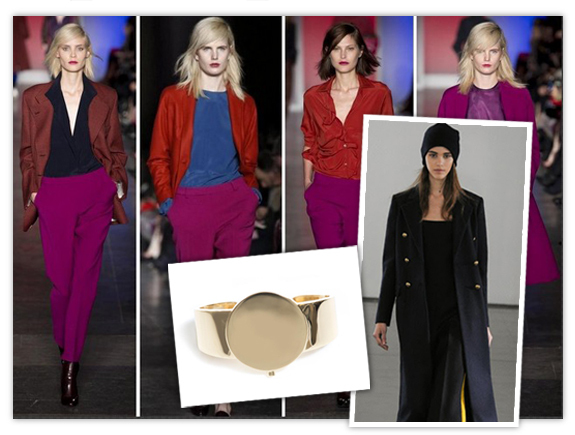 In the same vein, an accessory trend seen sweeping the runways of fall fashion week is the watch bracelet, a bracelet that dons the look of a watch face but doesn’t actually contain it. This is a relatively new look, and designers like Ina Seifart and Maison Martin Margiela are sporting styles in their collections in high polish gold and sleek sliver watch band styles. Nina Ricci’s version is a bit more demure, featuring rose quartz stones set in polished gold links.